Initially called the W.H.J Mayers Lodge of Instruction, the first moves to create our Lodge were made in 1946. 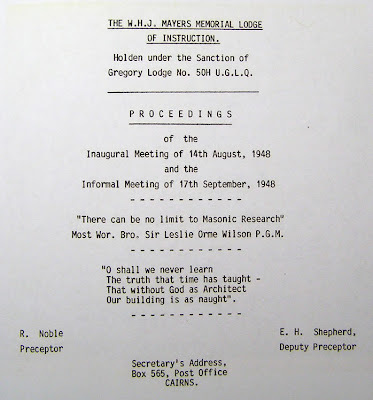 After some delays, the inaugural meeting of the W.H.J Mayers Lodge of Instruction was held on 14 August 1948, holden under the sanction of Gregory Lodge No.50H UGLQ. 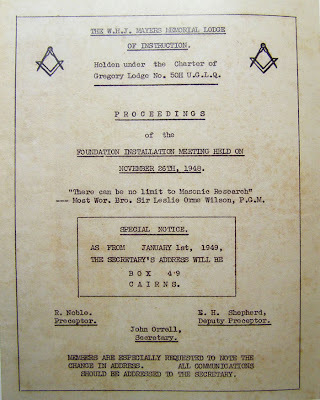 The next meeting of the Lodge was an informal one on the 17 September 1948 followed by the Foundation Installation on Friday 26 November 1948. At the Foundation Installation the District Grand Lodge entrusted the books of both the D.G.L Library and the very large Library of books that were forwarded from the private library of R.W Bro.W.H.J. Mayers to the Lodge of Instruction. 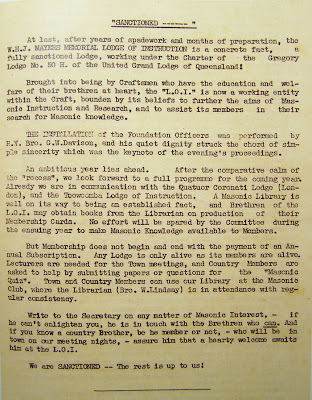 In the first year of the Lodges operation there were forty-two city members and eighty-four country members. Thanks were also given to the Treasurer and assistant Secretary for covering the costs of the installation cards. The above information was sourced from the book "Whence Come You" by R.W. Bro. A.D. Wakeham.